Sachinda Anuradha Wickramanayaka joined the Executive Committee of the Galadari Hotel from 01st January 2019 as Head of Marketing and Business Development. He will be directly involved in all areas relating to Marketing and Business Development. 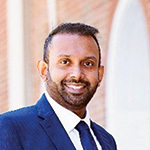 He brings with him a wealth of experience and expertise garnered from top corporate companies which include Lion Brewery Ceylon PLC, Dialog Axiata and Unilever Sri Lanka Ltd. His professional and academic qualifications include CIM (UK), holding Master’s in Business Specialization in Marketing from University of Monash Australia as well as other academic qualifications related to IT and Business.